Just about everyone who tries our wholesome body care products, becomes a believer... and usually a repeat customer! You'll love our body butters, body scrubs, delightful deodorants and you'll adore our amazing Complete Body Ultimate Moisturizer. Cilantro Citrus - clean and refreshing! Certified pure Bokek Premium Dead Sea salt. The highest mineral content, from Beer Shera, Israel. Ty all of our wonderful "flavors"! All natural, specially formulated deodorant for sensitive skin. If you have a problem with deodorants, this is for you! Lasts all day. Manfluence at its best in a man-sized stick! Sooth your body and soul. This is the quintessential of all moisturizers. The best butters and oils mixed with lanolin. Cracked fingers, dried feet, anywhere your body needs attention. A little goes the distance! 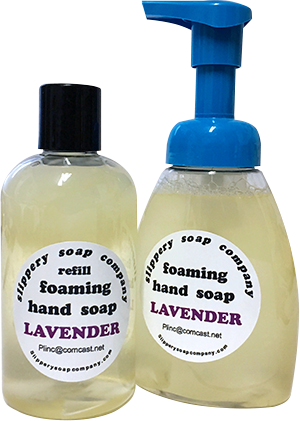 Our wonderful, all natural foaming hand soap - New Hampshire made without the chemicals of the national brands!